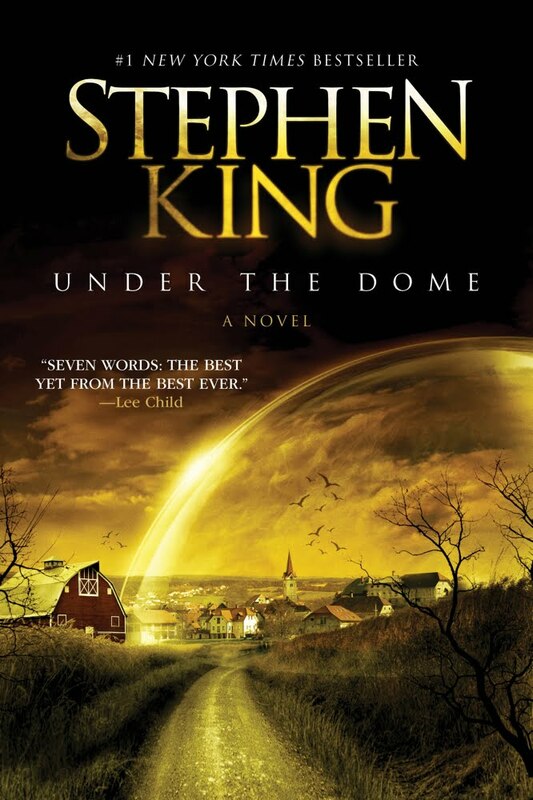 Stephen King’s latest, Under the Dome, is a massive literary achievement, at least in actual size. At over a thousand pages, this book can sprain wrists over a prolonged reading session and fracture skulls when wielded with evil intent. It’s not King’s longest work, at least if you count his multi-volume Dark Tower saga as a continuous story, but it’s a long-term commitment for the reader all the same. On the American cover, thriller writer Lee Child blurbs: ‘The Best Yet, From the Best Ever’. While calling King the ‘best ever’ is in the realm of outright silly hyperbole, the question remains: is this King’s crowning glory? Well, not quite, but at least it comes within a Green Mile of being it. The concept is as follows: an invisible barrier – a ‘dome’, if you will – plonks down over one of those small, typically American towns King loves to write about. From there on, things swiftly proceed to hell in a hand basket. After the first death toll (a plane and multiple cars crash into it, people and animals get sliced in two), unwise behavior of people under pressure soon leads to more fatalities. Then the semi-permeable barrier starts to cloud up because of pollution, the temperature slowly begins to rise under it and the clock is clearly ticking for all those who are trapped. The major catalyst for most things Bad are selectman/used car salesman ‘Big’ Jim Rennie and his son. The first stops at nothing to gain control over the town as soon as external authorities are cut off, the second is just plain psychotic. The most important players on the side of Good are former military man/cook Dale Barbara and Julia Shumway, owner of the local newspaper. They have to find a way to counter ‘Big’ Jim, while at the same time figuring out what is keeping the dome in place and how to make it go away. Complicating matters, especially in the second half of the book, is a meth lab which also ends up getting locked in. 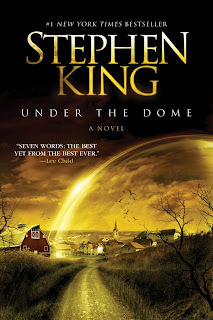 As almost every review has pointed out – a little gleefully – Stephen King must have been annoyed when this exact concept (‘small American town caught under see-through dome’) played out in The Simpsons Movie for laughs. King has claimed that it doesn’t bother him though, as the execution of the idea was completely unlike his version. King definitely came up with it earlier: 25 years ago he already took a stab at the first chapter for the book – which he actually used this time around, mostly intact – but he gave up because he didn’t know how to make it work. He does make it work this time around, though it’s not a complete success-story. First, the good. As always, King’s prose should come with racing stripes painted on the side. You are sped along, invested in the characters and interested to see what will happen next. There is always something exciting going on, so you don’t really ‘feel’ the length of the story, except in actual weight in your hands. There is the occasional duff, awkward line or simile but those are quickly passed by and forgotten. All of this is true of most of King’s books, whether he is going for straight-up horror or something more cerebral and literary. The basic set-up of Good versus Evil while under the assault of some overarching bad situation is also typical King. There isn’t a whole lot of moral grey area in the book: people are pretty much bad or good, with only a few stragglers lingering in the middle. Interestingly, there are a lot of Jesus-lovin’, Bible-thumpin’ hypocrites on the bad side. As a deeper allegory for the True Nature of Humanity or for global warming, Under the Dome doesn’t quite hit the bull’s-eye. King cheats too much with the specifics of the town that is portrayed. When it comes to keeping the action going, he probably was wise in having someone truly, insidiously Evil under the dome to speed up the decline of civilization, but psychologically more interesting might have been a slower slide into decay of a more morally ambiguous crowd. He cheats on the environmental aspect by having a meth lab complicate things, instead of stewing people in a prolonged local simulation of global warming. More grey area and a longer time-frame could have made for a more profound – if slower – story. A general criticism of King tends to be that the denouements of his books don’t live up to the skilful build-up. Unfortunately, the same goes for this one. Without getting into specifics or spoiling too much: for a large part of the book, things seem to be building up to a direct confrontation between Rennie, Barbie and their respective posse. Though there are some scuffles and casualties, the two main men never really face off. The ultimate explanation for the dome is also a bit vague and silly but ultimately irrelevant to the meat of the story: human behavior under extreme circumstances. Is it the best of King? Probably not. I prefer him a bit more creepy and my personal favorite is still It, which scared the pants of me, admittedly when I was a lot younger. And he has written books with more depth to them. But it is definitely a very entertaining read and should not be passed up by anyone who fancies sinking his mind into a big chunk of blood-speckled suspense.